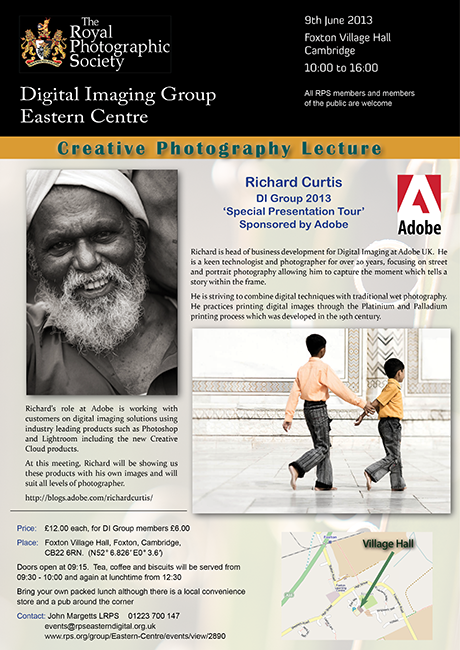 Richard is head of Business Development for Digital Imaging at Adobe in the UK. He is a keen technologist and a photographer for over 20 years with a strong focus on street and portrait photography allowing him to capture the moment and to tell a story within the frame. Richard is striving to combine digital techniques with traditional wet photography. He practices printing digital images through the Platinum and Palladium printing process which was developed in the 19th century. As with most photographers, he has his own set of influencers in the photography world :- Hiroshi Sugitomo, Irving Penn, Mary Ellen Mark, Henri Cartier Bresson, Arno Rafael Minnkkinen, George Tice, John Isaac and Sally Mann to name just a few. Richard’s role at Adobe is working with their customers focusing on Digital Imaging solutions such as Photoshop, Lightroom, Elements, Photoshop Touch as well as the new Adobe Creative Cloud Membership and Creative Cloud Team. Using examples of his own images, Richard will be covering what’s new in all applications and show us how they can improve our workflow and help with our own art. The lectures will be interactive an will suit all levels from beginners to advanced.